With a new businessman outsider in place as governor and more than 50 new faces in the Republican-controlled Legislature, optimism abounds at the Oklahoma Capitol about the session that begins Monday. Republican Gov. 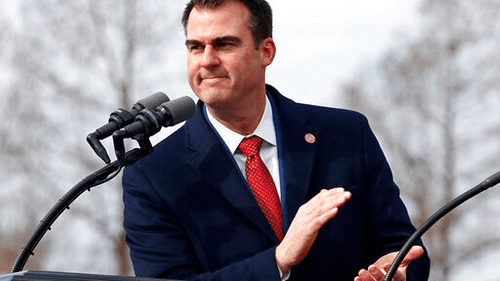 Kevin Stitt, who campaigned on making Oklahoma a “top ten” state, will lay out his vision for following through on that promise when he delivers his State of the State address and presents his proposed executive budget. Stitt said his priorities will be increased funding for public schools, expanding his ability to hire and fire agency directors and reducing the state’s prison population. The Oklahoma Education Association, the state’s largest teachers union, is pushing for more than $400 million in new funding for more pay raises, a cost-of-living boost for retirees and $150 million for school operations. Senate Republicans also want to see schools return to a five-day school week, arguing the switch to four-day weeks that nearly 20 percent of Oklahoma districts initially embraced as a cost-cutting move is now tarnishing the state’s reputation. A rebounding economy and a recent boom in the state’s oil patch means lawmakers will undoubtedly have more revenue to spend on next year’s budget. In December, a state panel projected a surplus of about $612 million over the current spending levels, but that number is expected to be lower when the final figure is certified later this month. Even with a surplus, state agencies already have requested more than $3.2 billion in additional spending, and legislative budget leaders are warning they also have pre-existing funding obligations like replacing lost federal revenue for the state’s two graduate medical schools and reimbursing schools and counties for property tax breaks offered to industries. Oklahoma now has the nation’s highest incarceration rate, the state’s prisons director says he needs more than $1 billion to build new prisons, and lawmakers and the governor seem poised to push for major changes to the state’s criminal justice system. The state’s law enforcement community and district attorneys, who bitterly opposed State Question 780, are expected to resist many of the changes being sought to ease tough sentences. Stitt says he wants the authority to hire and fire directors of the state’s largest agencies. Currently, governing boards have that power. Bills to give him that power, with Senate confirmation, have been introduced by new Senate President Pro Tem Greg Treat. A potential rub could come in the House, which would have diminished influence over agencies. House Speaker Charles McCall said this week his caucus is open to a plan that is “equitable to all branches of government.” House and Senate Democrats also have expressed opposition to the plan. A bill that would allow most adults to carry a firearm without a permit or training easily passed the Legislature last year, but then-Gov. Mary Fallin vetoed it amid opposition from the business community and law enforcement. Stitt said if lawmakers send him a similar bill this session, he’s willing to sign it.